Librarians at the Harriet K. & Philip Pumerantz Library at Western University of Health Sciences worked with the Dean of the College of Optometry to develop and teach a course on Evidence Based Practice (EBP) for third year optometry students. Librarians taught sections on EBP, EBP resources, health literacy, and staying current with the literature. These sections were taught didactically utilizing TurningPoint™ clicker technology to assess initial understanding by providing appropriately structured PICO statements using a multiple choice question format, thereby permitting the students to pick the “best” PICO statement. The instructor created assignments that would assess the students’ ability to apply EBP and the students’ long term ability to apply EBP concepts. While using TurningPoint™ clicker technology, it appeared that librarians were effective in teaching EBP when evaluating students immediately after the lecture. However, students were not able to apply EBP concepts effectively if structured PICO answers were not provided. This could be due to the fact that the concepts taught were not being effectively assessed by the assignments. Librarians concluded that they were able to effectively teach EBP concepts to students using a structured answer format. However, when students were asked to apply concepts without that structured answer format, they were unable to do so effectively. As a result, librarians see the need to work with the instructor to further refine and assess the instruction and assignments. 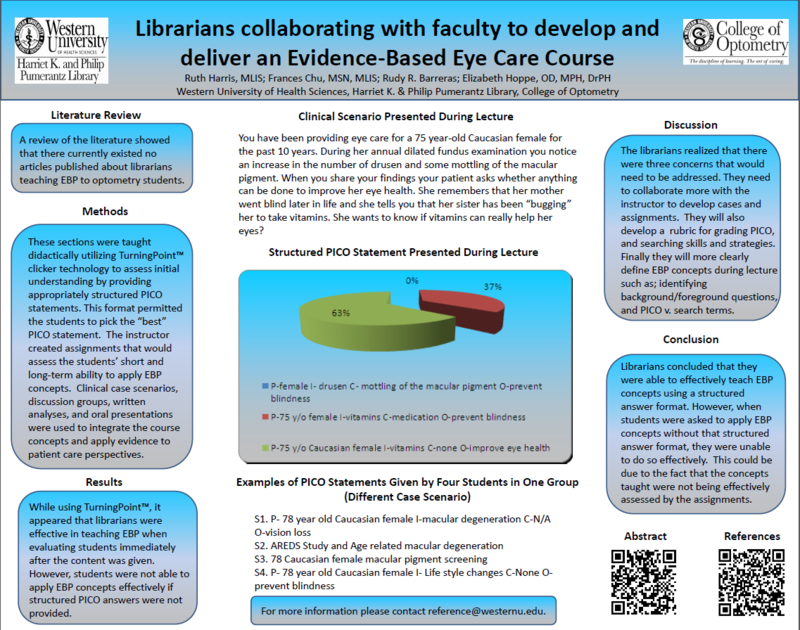 Download the full-size PDF of Ruth Harris, Frances Chu, and Rudy Barrera’s poster, Librarians Collaborating with Faculty to Develop and Deliver an Evidence-Based Eye Care Course.